Die Martis, 17° Aprilis 1832. Clyne v. Manson & Goldie, Appellant's Petition as to Recogce, referred to Appeal Com ee. Staley v. King & Hindle, Petition of Hindle for Time for his Case, referred to Appeal Com ee. Richardson to enter into a Recogce on The Dundee, &c. Railway Co's Appeal. Leave to Appellant to prosecute in formâ pauperis. Elections of Peers for Scotland, Paper respecting, delivered, & referred to Com ee on the Subject. Court of Exchequer Officers Bill. Indemnity Bill, Petitions from Galway against. Finances of India, Order for Estimate of, discharged, & another Order made. West India Colonies, Petition from Port Glasgow, &c. for Protection to. West India Colonies, Papers respecting, Ordered. 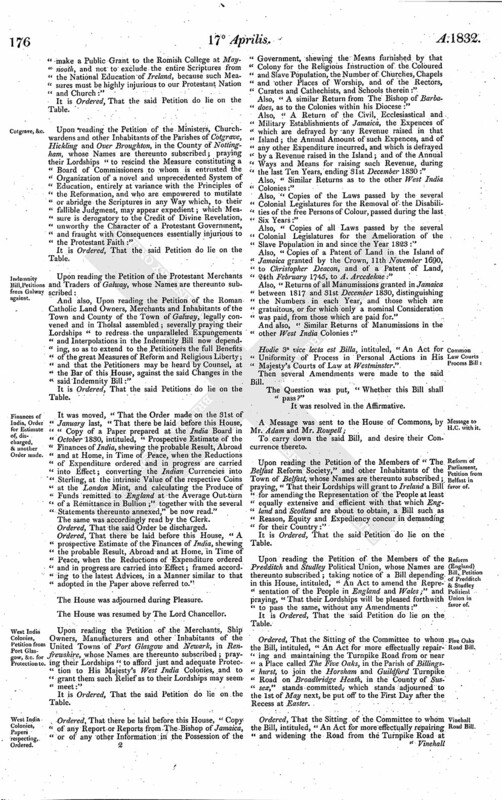 Reform of Parliament, Petition from Belfast in favor of. 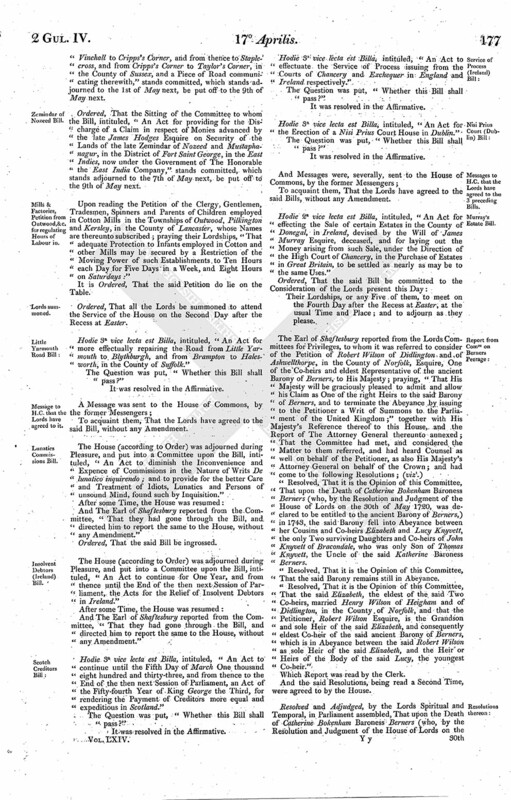 Reform (England) Bill, Petition of Predditch & Studley Political Union in favor of. Mills & Factories, Petition from Outwood, &c. for regulating Hours of Labour in. To be laid before His Majesty. Parliamentary Representation, Paper respecting, delivered. Address of Magistrates, &c. of Westmeath to The Ld. Lieutenant, &c. delivered. 2 Petitions from Glasgow referred to the Com ee. Friendly Societies Act Amendment Bill. Ds. Durham C. P. S.
Hodie 2a vice lecta est Billa, intituled, "An Act to invest a Part of the Entailed Estates of Brodie and others, in the Counties of Elgin and Nairn, in Trustees in Fee-Simple, for the Purpose of selling the Lands so vested, and of applying the Price thereof, or the Securities to be granted thereon, towards satisfying Debts, Provisions and others contracted by the Entailer, and for Money laid out or to be laid out by the Heir of Entail in the Improvement of the said Entailed Estates." Their Lordships, or any Five of them, to meet on the Third Day after the Recess at Easter, at Ten o'Clock in the Forenoon, in the Prince's Lodgings, near the House of Peers; and to adjourn as they please. Hodie 2a vice lecta est Billa, intituled, "An Act for more effectually repairing and improving the Road from Bishop Wearmouth to Norton, in the County of Durham." Hodie 2a vice lecta est Billa, intituled, "An Act for amending and rendering more effectual an Act of King George the Third, for improving the Pier and Port of Hartlepool, in the County of Durham." Hodie 2a vice lecta est Billa, intituled, "An Act for better maintaining the Road leading from Robeston Wathan to Saint Clears, and other Roads, in the Counties of Pembroke and Carmarthen; and for making several Branches from such Roads." Hodie 2a vice lecta est Billa, intituled, "An Act for more effectually repairing, amending and maintaining certain Roads and Bridges in the County of Berwick." Hodie 1a vice lecta est Billa, intituled, "An Act for separating the Rectory of Easington, in the County and Diocese of Durham, from the Archdeaconry of Durham, and annexing in lieu thereof a Prebend or Canonry founded in the Cathedral Church of Durham." Upon reading the Petition of David Clyne, Appellant in a Cause depending in this House, to which Alexander Manson and Archibald Watson Goldie are Respondents; praying, "That their Lordships will be pleased to order that Robert Manson Sinclair Rose of Old Broad Street, in the City of London, Merchant, may have Leave to enter into Recognizances for Costs in this Appeal, the Period appointed for receiving Recognizances having expired:"
Upon reading the Petition of Thomas Hindle, One of the Respondents in a Cause depending in this House, to which James Staley is Appellant, and John King and the said Thomas Hindle are Respondents; praying their Lordships, "That he may have a Month's further Time to prepare his printed Case:"
The House being moved, "That John Richardson of Fludyer Street, Westminster, Gentleman, may be permitted to enter into a Recognizance for The Dundee and Newtyle Railway Company, on account of their Appeal depending in this House:"
Upon reading the Petition and Appeal of Poor Duncan M'Dougall, late Post-runner at Ballygrant, in the Island of Islay, now residing in Edinburgh; complaining of an Interlocutor of the Lord Ordinary in Scotland, of the 3d of March 1830; also of an Interlocutor of the Lords of Session there, of the First Division, of the 22d of June 1830; and also of another Interlocutor of the said Lord Ordinary, of the 1st of July 1830; and praying, "That the same may be reversed, varied or altered, or that the Appellant may have such Relief in the Premises, as to this House, in their Lordships great Wisdom, shall seem meet; and that Jean Campbell, Hugh M'Dougall and Archibald M'Dougall, and the Tutors and Curators or Administrators in Law of the said Archibald M'Dougall, may be required to answer the said Appeal:"
It is Ordered, That the said Jean Campbell, and the several other Persons last named, may have a Copy of the said Appeal, and do put in their Answer or respective Answers thereunto, in Writing, on or before Tuesday the 15th Day of May next; and Service of this Order upon the said Respondents, or upon any one of their known Agents in the Court of Session in Scotland, shall be deemed good Service. It is Ordered, (upon reading the Affidavit and Certificate annexed to the said Petition,) That the Petitioner be at liberty to prosecute his said Appeal in this House in formâ pauperis, as desired. "Authentic Copies of the Minutes of the Proceedings at all Elections of Representative Peers for Scotland, from the Year 1801 to the Year 1822, both inclusive." Ordered, That the said Papers be referred to the Select Committee relating to Elections of Peers for Scotland. The House (according to Order) was adjourned during Pleasure, and put into a Committee upon the Bill, intituled, "An Act for the better Regulation of the Duties to be performed by the Officers on the Plea or Common Law Side of the Court of Exchequer." 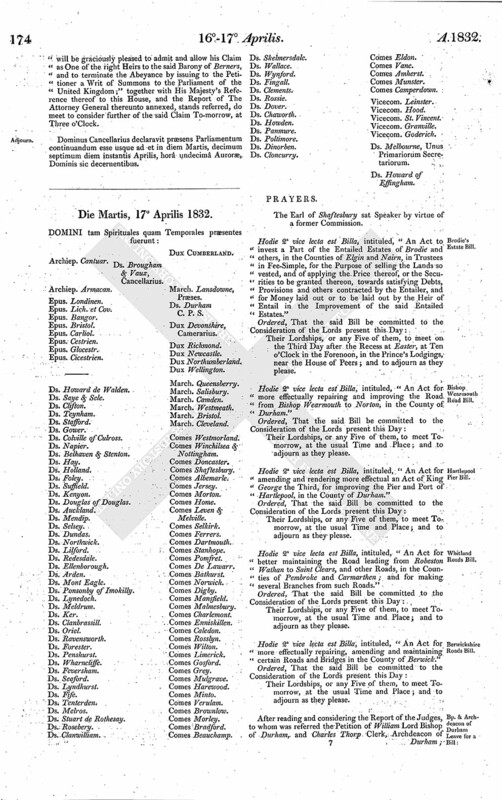 Upon reading the Petition of the Ministers and Elders of the Synod of Glasgow and Ayr, met in Synod at Ayr, praying their Lordships "to withhold their Countenance and Support from any Scheme of Education for Ireland, which shall in any way interfere with the free Use of the Word of God:"
Upon reading the Petition of the Ministers and Elders of the Provincial Synod of Fife, in Synod assembled; praying their Lordships, "That no Legislative Measure may be enacted, and no Grant of Public Money conferred, in furtherance of the Scheme for National Education proposed to be adopted in Ireland, which is manifestly calculated to retard the Progress of Christian Knowledge, and to obstruct the free Course of that Divine Word by which alone Men can be made wise unto Salvation:"
Upon reading the Petition of the Ministers and Elders of the Presbytery of Annan, in Presbytery assembled; praying their Lordships "to adopt Measures for the Education of the Irish People, founded on the Word of God and under the special Controul of the Protestant Church; or, at least, to abolish the System recently adopted by Government:"
Upon reading the Petition of the Ministers and Elders of the Presbytery of Forfar; praying their Lordships "to refuse the Sanction of their Authority to the proposed Scheme of National Education for Ireland in its present Shape, and not to allow it to pass into a Law:"
Upon reading the Petition of the Ministers and Elders of the Presbytery of Saint Andrews, whose Names are thereunto subscribed; praying their Lordships "to withhold their Sanction from a System of Education in Ireland fraught with Danger to the best and dearest Interests, not only of Ireland, but of the whole British Empire; and that no Parliamentary Aid, Countenance or Encouragement may be given to any Plan of National Instruction which does not adopt as its Basis the Scriptures pure and unmutilated, and which does not concede to Persons of all Descriptions the unrestricted Use of that Blessed Book which shows the Way of Salvation in this World, and inspires the Hope of Life everlasting in that which is to come:"
Upon reading the Petition of the Inhabitants of Ashburne, in the County of Derby, whose Names are thereunto subscribed; praying their Lordships, "That the Plan of National Education for Ireland, which has lately been proposed by His Majesty's Government, may not receive the Support of this House, and that the Public Grant to the Romish College at Maynooth may be discontinued:"
Upon reading the Petition of the Incumbent, Curate and Members of the Congregation of Saint James' Church, Standard Hill, near Nottingham, whose Names are thereunto subscribed; praying their Lordships "no longer to make a Public Grant to the Romish College at Maynooth, and not to exclude the entire Scriptures from the National Education of Ireland, because such Measures must be highly injurious to our Protestant Nation and Church:"
Upon reading the Petition of the Ministers, Churchwardens and other Inhabitants of the Parishes of Cotgrave, Hickling and Over Broughton, in the County of Nottingham, whose Names are thereunto subscribed; praying their Lordships "to rescind the Measure constituting a "Board of Commissioners to whom is entrusted the Organization of a novel and unprecedented System of Education, entirely at variance with the Principles of the Reformation, and who are empowered to mutilate or abridge the Scriptures in any Way which, to their fallible Judgment, may appear expedient; which Measure is derogatory to the Credit of Divine Revelation, unworthy the Character of a Protestant Government, and fraught with Consequences essentially injurious to the Protestant Faith:"
And also, Upon reading the Petition of the Roman Catholic Land Owners, Merchants and Inhabitants of the Town and County of the Town of Galway, legally convened and in Tholsal assembled; severally praying their Lordships "to redress the unparalleled Expungements and Interpolations in the Indemnity Bill now depending, so as to extend to the Petitioners the full Benefits of the great Measures of Reform and Religious Liberty; and that the Petitioners may be heard by Counsel, at the Bar of this House, against the said Changes in the said Indemnity Bill:"
It was moved, "That the Order made on the 31st of January last, "That there be laid before this House, "Copy of a Paper prepared at the India Board in October 1830, intituled, "Prospective Estimate of the Finances of India, shewing the probable Result, Abroad and at Home, in Time of Peace, when the Reductions of Expenditure ordered and in progress are carried into Effect; converting the Indian Currencies into Sterling, at the intrinsic Value of the respective Coins at the London Mint, and calculating the Produce of Funds remitted to England at the Average Out-turn of a Remittance in Bullion;" together with the several Statements thereunto annexed," be now read." Ordered, That there be laid before this House, "A prospective Estimate of the Finances of India, shewing the probable Result, Abroad and at Home, in Time of Peace, when the Reductions of Expenditure ordered and in progress are carried into Effect; framed according to the latest Advices, in a Manner similar to that adopted in the Paper above referred to." Upon reading the Petition of the Merchants, Ship Owners, Manufacturers and other Inhabitants of the United Towns of Port Glasgow and Newark, in Renfrewshire, whose Names are thereunto subscribed; praying their Lordships "to afford just and adequate Protection to His Majesty's West India Colonies, and to grant them such Relief as to their Lordships may seem meet:"
Ordered, That there be laid before this House, "Copy of any Report or Reports from The Bishop of Jamaica, or of any other Information in the Possession of the Government, shewing the Means furnished by that Colony for the Religious Instruction of the Coloured and Slave Population, the Number of Churches, Chapels and other Places of Worship, and of the Rectors, Curates and Cathechists, and Schools therein:"
Also, "A similar Return from The Bishop of Barbadoes, as to the Colonies within his Diocese:"
Also, "A Return of the Civil, Ecclesiastical and Military Establishments of Jamaica, the Expences of which are defrayed by any Revenue raised in that Island; the Annual Amount of such Expences, and of any other Expenditure incurred, and which is defrayed by a Revenue raised in the Island; and of the Annual Ways and Means for raising such Revenue, during the last Ten Years, ending 31st December 1830:"
Also, "Similar Returns as to the other West India Colonies:"
Also, "Copies of the Laws passed by the several Colonial Legislatures for the Removal of the Disabilities of the free Persons of Colour, passed during the last Six Years:"
Also, "Copies of all Laws passed by the several Colonial Legislatures for the Amelioration of the Slave Population in and since the Year 1823:"
Also, "Copies of a Patent of Land in the Island of Jamaica granted by the Crown, 11th November 1690, to Christopher Deacon, and of a Patent of Land, 24th February 1745, to A. Arcedekne:"
Also, "Returns of all Manumissions granted in Jamaica between 1817 and 31st December 1830, distinguishing the Numbers in each Year, and those which are gratuitous, or for which only a nominal Consideration was paid, from those which are paid for." And also, "Similar Returns of Manumissions in the other West India Colonies:"
Hodie 3a vice lecta est Billa, intituled, "An Act for Uniformity of Process in Personal Actions in His Majesty's Courts of Law at Westminster." 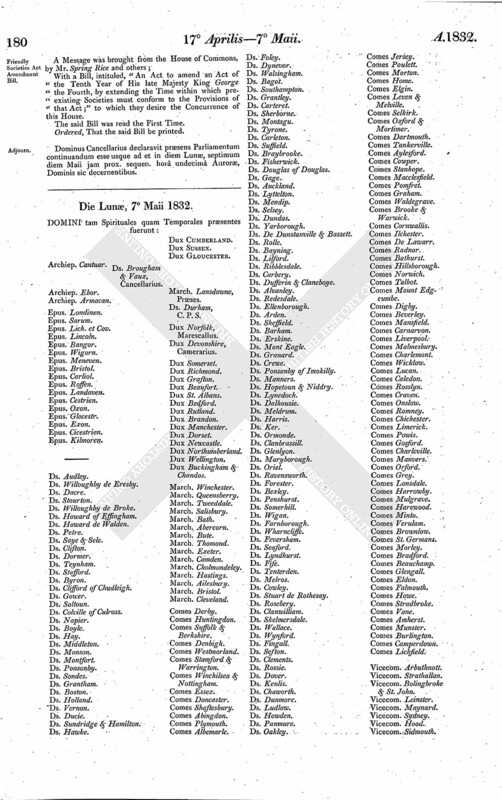 Upon reading the Petition of the Members of "The Belfast Reform Society," and other Inhabitants of the Town of Belfast, whose Names are thereunto subscribed; praying, "That their Lordships will grant to Ireland a Bill for amending the Representation of the People at least equally extensive and efficient with that which England and Scotland are about to obtain, a Bill such as Reason, Equity and Expediency concur in demanding for their Country:"
Upon reading the Petition of the Members of the Predditch and Studley Political Union, whose Names are thereunto subscribed; taking notice of a Bill depending in this House, intituled, "An Act to amend the Representation of the People in England and Wales;" and praying, "That their Lordships will be pleased forthwith to pass the same, without any Amendments:"
Ordered, That the Sitting of the Committee to whom the Bill, intituled, "An Act for more effectually repairing and maintaining the Turnpike Road from or near a Place called The Five Oaks, in the Parish of Billingshurst, to join the Horsham and Guildford Turnpike Road on Broadbridge Heath, in the County of Sussex," stands committed, which stands adjourned to the 1st of May next, be put off to the First Day after the Recess at Easter. Ordered, That the Sitting of the Committee to whom the Bill, intituled, "An Act for more effectually repairing and widening the Road from the Turnpike Road at Vinehall to Cripps's Corner, and from thence to Staplecross, and from Cripps's Corner to Taylor's Corner, in the County of Sussex, and a Piece of Road communicating therewith," stands committed, which stands adjourned to the 1st of May next, be put off to the 9th of May next. 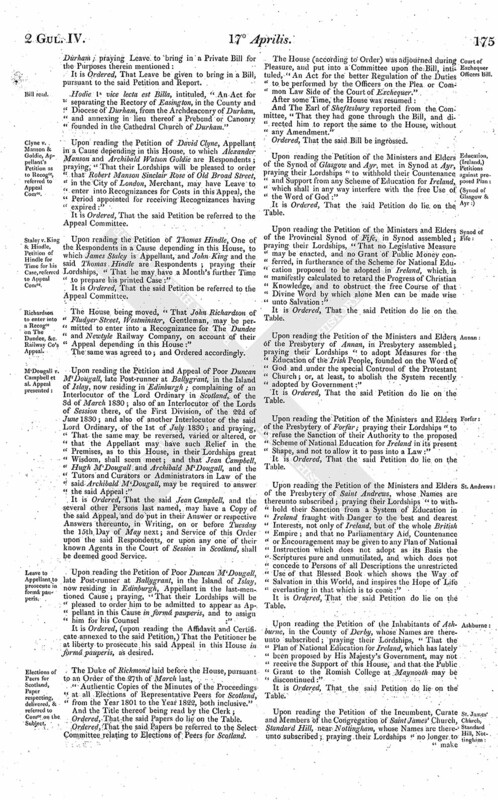 Ordered, That the Sitting of the Committee to whom the Bill, intituled, "An Act for providing for the Discharge of a Claim in respect of Monies advanced by the late James Hodges Esquire on Security of the Lands of the late Zemindar of Nozeed and Mustaphanagur, in the District of Fort Saint George, in the East Indies, now under the Government of The Honorable the East India Company," stands committed, which stands adjourned to the 7th of May next, be put off to the 9th of May next. Upon reading the Petition of the Clergy, Gentlemen, Tradesmen, Spinners and Parents of Children employed in Cotton Mills in the Townships of Outwood, Pilkington and Kersley, in the County of Lancaster, whose Names are thereunto subscribed; praying their Lordships, "That adequate Protection to Infants employed in Cotton and other Mills may be secured by a Restriction of the Moving Power of such Establishments to Ten Hours each Day for Five Days in a Week, and Eight Hours on Saturdays:"
Ordered, That all the Lords be summoned to attend the Service of the House on the Second Day after the Recess at Easter. Hodie 3a vice lecta est Billa, intituled, "An Act for more effectually repairing the Road from Little Yarmouth to Blythburgh, and from Brampton to Halesworth, in the County of Suffolk." The House (according to Order) was adjourned during Pleasure, and put into a Committee upon the Bill, intituled, "An Act to diminish the Inconvenience and Expence of Commissions in the Nature of Writs De lunatico inquirendo; and to provide for the better Care and Treatment of Idiots, Lunatics and Persons of unsound Mind, found such by Inquisition." The House (according to Order) was adjourned during Pleasure, and put into a Committee upon the Bill, intituled, "An Act to continue for One Year, and from thence until the End of the then next Session of Parliament, the Acts for the Relief of Insolvent Debtors in Ireland." Hodie 3a vice lecta est Billa, intituled, "An Act to continue until the Fifth Day of March One thousand eight hundred and thirty-three, and from thence to the End of the then next Session of Parliament, an Act of the Fifty-fourth Year of King George the Third, for rendering the Payment of Creditors more equal and expeditious in Scotland." Hodie 3a vice lecta est Billa, intituled, "An Act to effectuate the Service of Process issuing from the Courts of Chancery and Exchequer in England and Ireland respectively." Hodie 3a vice lecta est Billa, intituled, "An Act for the Erection of a Nisi Prius Court House in Dublin." Hodie 2a vice lecta est Billa, intituled, "An Act for effecting the Sale of certain Estates in the County of Donegal, in Ireland, devised by the Will of James Murray Esquire, deceased, and for laying out the Money arising from such Sale, under the Direction of the High Court of Chancery, in the Purchase of Estates in Great Britain, to be settled as nearly as may be to the same Uses." Their Lordships, or any Five of them, to meet on the Fourth Day after the Recess at Easter, at the usual Time and Place; and to adjourn as they please. "Resolved, That it is the Opinion of this Committee, That upon the Death of Catherine Bokenham Baroness Berners (who, by the Resolution and Judgment of the House of Lords on the 30th of May 1720, was declared to be entitled to the ancient Barony of Berners,) in 1743, the said Barony fell into Abeyance between her Cousins and Co-heirs Elizabeth and Lucy Knyvett, the only Two surviving Daughters and Co-heirs of John Knyvett of Bracondale, who was only Son of Thomas Knyvett, the Uncle of the said Katherine Baroness Berners. "Resolved, That it is the Opinion of this Committee, That the said Barony remains still in Abeyance. "Resolved, That it is the Opinion of this Committee, That the said Elizabeth, the eldest of the said Two Co-heirs, married Henry Wilson of Heigham and of Didlington, in the County of Norfolk, and that the Petitioner, Robert Wilson Esquire, is the Grandson and sole Heir of the said Elizabeth, and consequently eldest Co-heir of the said ancient Barony of Berners, which is in Abeyance between the said Robert Wilson as sole Heir of the said Elizabeth, and the Heir or Heirs of the Body of the said Lucy, the youngest Co-heir." And the said Resolutions, being read a Second Time, were agreed to by the House. Resolved and Adjudged, by the Lords Spiritual and Temporal, in Parliament assembled, That upon the Death of Catherine Bokenham Baroness Berners (who, by the Resolution and Judgment of the House of Lords on the 30th of May 1720 was declared to be entitled to the ancient Barony of Berners,) in 1743, the said Barony fell into Abeyance between her Cousins and Co-heirs Elizabeth and Lucy Knyvett, the only Two surviving Daughters and Co-heirs of John Knyvett of Bracondale, who was only Son of Thomas Knyvett, the Uncle of the said Katherine Baroness Berners. Resolved and Adjudged, by the Lords Spiritual and Temporal, in Parliament assembled, That the said Barony remains still in Abeyance. Resolved and Adjudged, by the Lords Spiritual and Temporal, in Parliament assembled, That the said Elizabeth, the eldest of the said Two Co-heirs, married Henry Wilson of Heigham and of Didlington, in the County of Norfolk, and that the Petitioner, Robert Wilson Esquire, is the Grandson and sole Heir of the said Elizabeth, and consequently eldest Co-heir of the said ancient Barony of Berners, which is in Abeyance between the said Robert Wilson as sole Heir of the said Elizabeth, and the Heir or Heirs of the Body of the said Lucy, the youngest Co-heir. Ordered, That the said Resolutions and Judgments be laid before His Majesty by the Lords with White Staves. 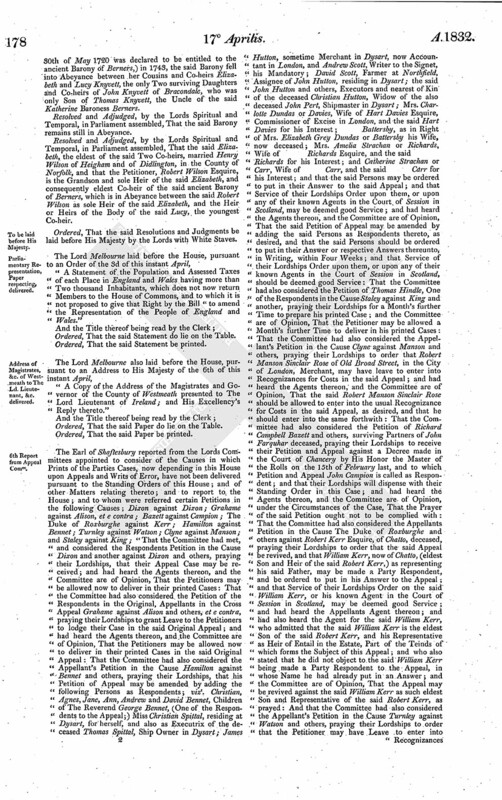 "A Statement of the Population and Assessed Taxes of each Place in England and Wales having more than Two thousand Inhabitants, which does not now return Members to the House of Commons, and to which it is not proposed to give that Right by the Bill "to amend the Representation of the People of England and Wales." Ordered, That the said Statement do lie on the Table. Ordered, That the said Statement be printed. "A Copy of the Address of the Magistrates and Governor of the County of Westmeath presented to The Lord Lieutenant of Ireland; and His Excellency's Reply thereto." The Earl of Shaftesbury reported from the Lords Committees appointed to consider of the Causes in which Prints of the Parties Cases, now depending in this House upon Appeals and Writs of Error, have not been delivered pursuant to the Standing Orders of this House; and of other Matters relating thereto; and to report to the House; and to whom were referred certain Petitions in the following Causes; Dixon against Dixon; Grahame against Alison, et e contra; Bazett against Campion; The Duke of Roxburghe against Kerr; Hamilton against Bennet; Turnley against Watson; Clyne against Manson; and Staley against King; "That the Committee had met, and considered the Respondents Petition in the Cause Dixon and another against Dixon and others, praying their Lordships, that their Appeal Case may be received; and had heard the Agents thereon, and the Committee are of Opinion, That the Petitioners may be allowed now to deliver in their printed Cases: That the Committee had also considered the Petition of the Respondents in the Original, Appellants in the Cross Appeal Grahame against Alison and others, et e contra, praying their Lordships to grant Leave to the Petitioners to lodge their Case in the said Original Appeal; and had heard the Agents thereon, and the Committee are of Opinion, That the Petitioners may be allowed now to deliver in their printed Cases in the said Original Appeal: That the Committee had also considered the Appellant's Petition in the Cause Hamilton against Bennet and others, praying their Lordships, that his Petition of Appeal may be amended by adding the following Persons as Respondents; vizt. Christian, Agnes, Jane, Ann, Andrew and David Bennet, Children of The Reverend George Bennet, (One of the Respondents to the Appeal;) Miss Christian Spittal, residing at Dysart, for herself, and also as Executrix of the deceased Thomas Spittal, Ship Owner in Dysart; James Hutton, sometime Merchant in Dysart, now Accountant in London, and Andrew Scott, Writer to the Signet, his Mandatory; David Scott, Farmer at Northfield, Assignee of John Hutton, residing in Dysart; the said John Hutton and others, Executors and nearest of Kin of the deceased Christian Hutton, Widow of the also deceased John Pert, Shipmaster in Dysart; Mrs. Charlotte Dundas or Davies, Wife of Hart Davies Esquire, Commissioner of Excise in London, and the said Hart Davies for his Interest; Battersby, as in Right of Mrs. Elizabeth Grey Dundas or Battersby his Wife, now deceased; Mrs. Amelia Strachan or Richards, Wife of Richards Esquire, and the said Richards for his Interest; and Catherine Strachan or Carr, Wife of Carr, and the said Carr for his Interest; and that the said Persons may be ordered to put in their Answer to the said Appeal; and that Service of their Lordships Order upon them, or upon any of their known Agents in the Court of Session in Scotland, may be deemed good Service; and had heard the Agents thereon, and the Committee are of Opinion, That the said Petition of Appeal may be amended by adding the said Persons as Respondents thereto, as desired, and that the said Persons should be ordered to put in their Answer or respective Answers thereunto, in Writing, within Four Weeks; and that Service of their Lordships Order upon them, or upon any of their known Agents in the Court of Session in Scotland, should be deemed good Service: That the Committee had also considered the Petition of Thomas Hindle, One of the Respondents in the Cause Staley against King and another, praying their Lordships for a Month's further Time to prepare his printed Case; and the Committee are of Opinion, That the Petitioner may be allowed a Month's further Time to deliver in his printed Cases: That the Committee had also considered the Appellant's Petition in the Cause Clyne against Manson and others, praying their Lordships to order that Robert Manson Sinclair Rose of Old Broad Street, in the City of London, Merchant, may have leave to enter into Recognizances for Costs in the said Appeal; and had heard the Agents thereon, and the Committee are of Opinion, That the said Robert Manson Sinclair Rose should be allowed to enter into the usual Recognizance for Costs in the said Appeal, as desired, and that he should enter into the same forthwith: That the Committee had also considered the Petition of Richard Campbell Bazett and others, surviving Partners of John Farquhar deceased, praying their Lordships to receive their Petition and Appeal against a Decree made in the Court of Chancery by His Honor the Master of the Rolls on the 15th of February last, and to which Petition and Appeal John Campion is called as Respondent; and that their Lordships will dispense with their Standing Order in this Case; and had heard the Agents thereon, and the Committee are of Opinion, under the Circumstances of the Case, That the Prayer of the said Petition ought not to be complied with: That the Committee had also considered the Appellants Petition in the Cause The Duke of Roxburghe and others against Robert Kerr Esquire, of Chatto, deceased, praying their Lordships to order that the said Appeal be revived, and that William Kerr, now of Chatto, (eldest Son and Heir of the said Robert Kerr,) as representing his said Father, may be made a Party Respondent, and be ordered to put in his Answer to the Appeal; and that Service of their Lordships Order on the said William Kerr, or his known Agent in the Court of Session in Scotland, may be deemed good Service; and had heard the Appellants Agent thereon; and had also heard the Agent for the said William Kerr, who admitted that the said William Kerr is the eldest Son of the said Robert Kerr, and his Representative as Heir of Entail in the Estate, Part of the Teinds of which forms the Subject of this Appeal; and who also stated that he did not object to the said William Kerr being made a Party Respondent to the Appeal, in whose Name he had already put in an Answer; and the Committee are of Opinion, That the Appeal may be revived against the said William Kerr as such eldest Son and Representative of the said Robert Kerr, as prayed: And that the Committee had also considered the Appellant's Petition in the Cause Turnley against Watson and others, praying their Lordships to order that the Petitioner may have Leave to enter into Recognizances in Scotland, or to make such other Order as the Exigency of the Case may seem to require, and as to their Lordships shall seem meet; and had heard the Appellant's Agent thereon, who stated to the Committee, that the Petitioner is now detained a Prisoner in the Jail of Glasgow, by virtue of the Judgments now under Appeal, and is consequently unable (although willing and anxious) to attend their Lordships for the Purpose of entering into the usual Recognizance; and had also heard the Respondents Agent thereon; and the Committee are of Opinion, under the special Circumstances of the Case, That The Provost of Glasgow, or, in his Absence, One of the Magistrates of Glasgow, should be empowered to take, within Twenty-one Days from the Date when this Report shall be made to the House, the usual Security by Recognizance to be entered into by the said Appellant Elizabeth Turnley to The King, in the Penalty of Four hundred Pounds, conditioned to pay all such Costs to the Respondents in this Appeal as this House shall think fit to order upon the Hearing thereof, or by any other Order made in the Matter of the Appeal; and that for the Purpose of carrying this Matter into Effect the usual Recognizance Instrument, made out with such Alterations only as the Case may require, should be transmitted by the Clerk Assistant to the said Provost of Glasgow, with Directions that it be executed by the said Appellant before the said Provost or One of the Magistrates of Glasgow, as recommended by the Committee, and returned to the Clerk Assistant on or before the Expiration of the said Twenty-one Days; and that in the meantime the said Appeal ought not to be dismissed for Want of the Recognizance." 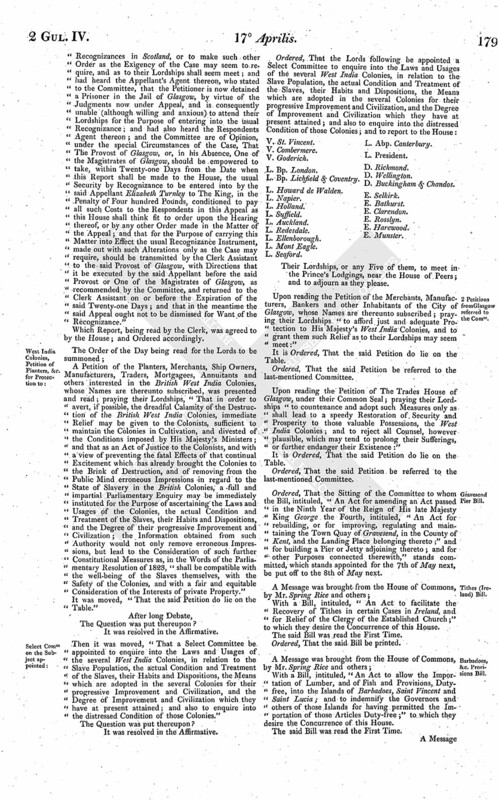 A Petition of the Planters, Merchants, Ship Owners, Manufacturers, Traders, Mortgagees, Annuitants and others interested in the British West India Colonies, whose Names are thereunto subscribed, was presented and read; praying their Lordships, "That in order to avert, if possible, the dreadful Calamity of the Destruction of the British West India Colonies, immediate Relief may be given to the Colonists, sufficient to maintain the Colonies in Cultivation, and divested of the Conditions imposed by His Majesty's Ministers; and that as an Act of Justice to the Colonists, and with a view of preventing the fatal Effects of that continual Excitement which has already brought the Colonies to the Brink of Destruction, and of removing from the Public Mind erroneous Impressions in regard to the State of Slavery in the British Colonies, a full and impartial Parliamentary Enquiry may be immediately instituted for the Purpose of ascertaining the Laws and Usages of the Colonies, the actual Condition and Treatment of the Slaves, their Habits and Dispositions, and the Degree of their progressive Improvement and Civilization; the Information obtained from such Authority would not only remove erroneous Impressions, but lead to the Consideration of such further Constitutional Measures as, in the Words of the Parliamentary Resolution of 1823, "shall be compatible with the well-being of the Slaves themselves, with the Safety of the Colonies, and with a fair and equitable Consideration of the Interests of private Property." It was moved, "That the said Petition do lie on the Table." Then it was moved, "That a Select Committee be appointed to enquire into the Laws and Usages of the several West India Colonies, in relation to the Slave Population, the actual Condition and Treatment of the Slaves, their Habits and Dispositions, the Means which are adopted in the several Colonies for their progressive Improvement and Civilization, and the Degree of Improvement and Civilization which they have at present attained; and also to enquire into the distressed Condition of those Colonies." L. Seaford. L. Abp. Canterbury. Upon reading the Petition of the Merchants, Manufacturers, Bankers and other Inhabitants of the City of Glasgow, whose Names are thereunto subscribed; praying their Lordships "to afford just and adequate Protection to His Majesty's West India Colonies, and to grant them such Relief as to their Lordships may seem meet:"
Upon reading the Petition of The Trades House of Glasgow, under their Common Seal; praying their Lordships "to countenance and adopt such Measures only as shall lead to a speedy Restoration of Security and Prosperity to those valuable Possessions, the West India Colonies; and to reject all Counsel, however plausible, which may tend to prolong their Sufferings, or further endanger their Existence:"
Ordered, That the Sitting of the Committee to whom the Bill, intituled, "An Act for amending an Act passed in the Ninth Year of the Reign of His late Majesty King George the Fourth, intituled, "An Act for rebuilding, or for improving, regulating and maintaining the Town Quay of Gravesend, in the County of Kent, and the Landing Place belonging thereto;" and for building a Pier or Jetty adjoining thereto; and for other Purposes connected therewith," stands committed, which stands appointed for the 7th of May next, be put off to the 8th of May next. With a Bill, intituled, "An Act to facilitate the Recovery of Tithes in certain Cases in Ireland, and for Relief of the Clergy of the Established Church;" to which they desire the Concurrence of this House. With a Bill, intituled, "An Act to allow the Importation of Lumber, and of Fish and Provisions, Dutyfree, into the Islands of Barbadoes, Saint Vincent and Saint Lucia; and to indemnify the Governors and others of those Islands for having permitted the Importation of those Articles Duty-free;" to which they desire the Concurrence of this House. With a Bill, intituled, "An Act to amend an Act of the Tenth Year of His late Majesty King George the Fourth, by extending the Time within which preexisting Societies must conform to the Provisions of that Act;" to which they desire the Concurrence of this House. Dominus Cancellarius declaravit præsens Parliamentum continuandum esse usque ad et in diem Lunæ, septimum diem Maii jam prox. sequen. horâ undecimâ Auroræ, Dominis sic decernentibus.